It is the last day of 2017, the eve of a new year. I’ve taken the ornaments off our Christmas tree and laid them out on a black and white wool blanket on the cocktail table. For the first time, I took a picture of the complete collection before individually wrapping and storing them in the attic. If truth be told, I consider the annual tradition of decorating my Christmas tree an artistic act of creation not unlike painting on a canvas, or weaving words into a story; my own personal masterpiece shared with my family and a few close friends. I was introduced to the notion of collecting Christmas ornaments by Sally, mother of John, a young man I was dating during my senior year of college in 1970. 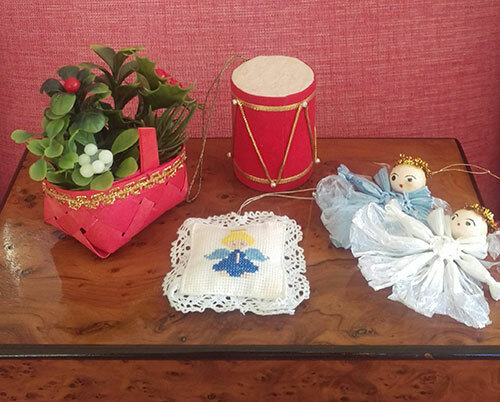 Sally’s Christmas tree held an exquisite collection of artifacts from her past, and it was she who gave me the handmade ornaments—a basket of holly, a felt drum, a tiny embroidered pillow, and two fragile angels—with which to start my own collection. Forty-seven Christmases later, I once again hung Sally’s gifts on a field-run Fraser fir, once again sparking memories of that young romance, ripe with promise and later, seared by disappointment. 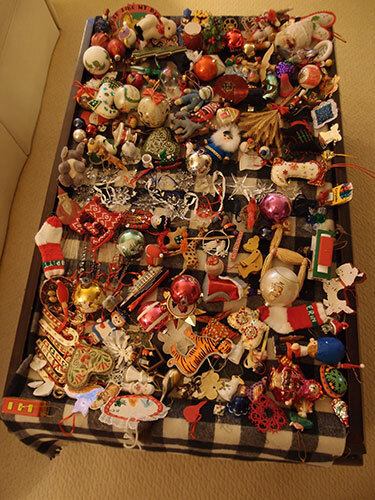 Over the years my collection of Christmas ornaments and memories has grown. Now it takes me the better part of two days to decorate the tree, slowed down by sacred moments of remembering and my need for perfection. 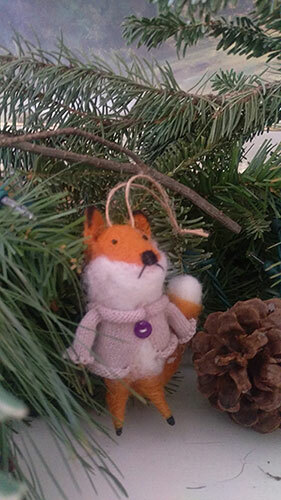 This Christmas, our two-year-old granddaughter Ofelia added a new ornament: a felt fox wearing a tan cardigan with a purple button. She also added a spirit of joy and wonder to the holiday as only a young child with an unfettered imagination can do. According to Ofelia, “It’s not a party without a balloon.” Soon she was gripping a shiny, bright red floating helium star—a gift from her parents—in her small hand as she wove her way among aunts, uncles, cousins, a giant greyhound, and a dog named Daisy on Christmas Eve. Now I look at my bare, dying and drying Christmas tree one last time before it will become part of a habitat in a corner of our backyard where two wild rabbits live. I think about the year 2017 with its abundance of joys and sorrows in almost equal measure. No doubt 2018 will be the same. Joys and sorrows … I have no answers for why life is like this. Mostly, I guess all that I, or you, or anyone can hope for is to hold each and every moment graced by a bright and shiny red star a little more tightly. Happy New Year, Dear Readers and Friends! So happy to know that you read it. Thank YOU! So happy to know that you read it, Georgia. Thank YOU!